Sorrento is an easy day trip from Naples or an excellent home base for exploring the top travel destinations in Campania, including the Amalfi Coast, Pompeii, the island of Capri, Naples and so much more. Enjoy shopping in Sorrento during your holiday in Italy! The town of Sorrento in southern Italy's Campania region has been attracting visitors since ancient times when the Greeks and later the Romans created a settlement on a scenic plateau along a gorgeous coastline just south of Naples. 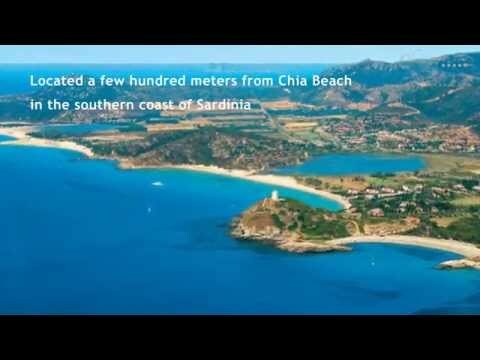 The fine views and ideal setting have made it a popular spot ever since. Today tourists arrive from all over the world to stroll along the charming streets, to see the architecture highlights of Sorrento and, of course, to enjoy some topnotch shopping! Here's a guide to the best shopping spots and the traditional products for your visit to Sorrento. The best spot to start your shopping experience in Sorrento is right in the heart of town in Piazza Tasso. This large piazza is one of the busiest and most popular areas in Sorrento and is crossed by Corso Italia (above), which is one of the best shopping streets in Sorrento. While the traffic can be a bit crazy during the day, during warm summer evenings Corso Italia and Piazza Tasso are transformed into a large pedestrian zone and the streets are turned over to shoppers. This is a popular shopping area with locals and tourists alike, and it's also a top spot for the evening passeggiata with family and friends while enjoying a gelato. The bright yellows and reds of the buildings creates a colorful backdrop while shopping along Corso Italia. This is where you'll find the best fashion boutiques for men and women, shoe stores and home ware stores in Sorrento. 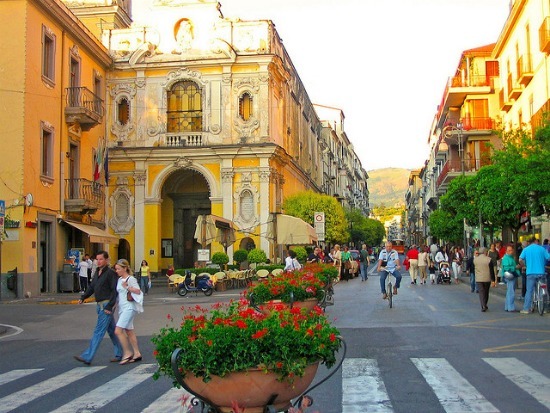 From Corso Italia, follow the narrow cross streets into the historic center of Sorrento. 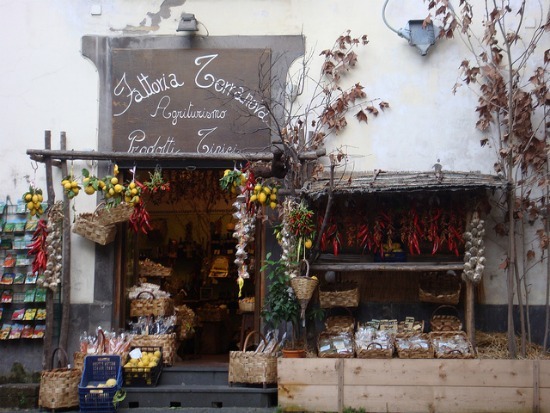 Here you'll find tons of little shops selling traditional Sorrento crafts, handmade leather sandals, food specialties and gift shops. 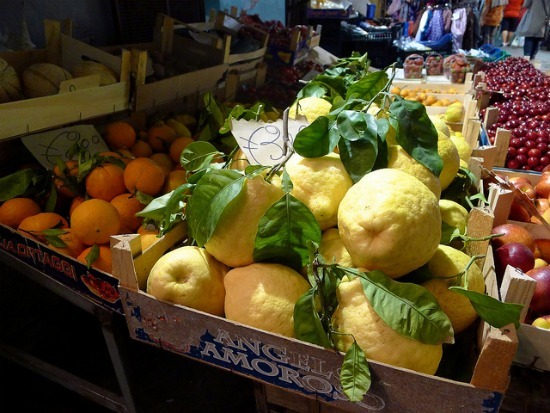 One of the highlights you'll easily spot in the fruit and vegetable shops are the famous Sorrento lemons grown on the steep mountainside terraces along the coastline. They are a special variety of lemons that have an intense flavor and vibrant yellow skin that is perfect for making the region's famous limoncello, a lemon infused liqueur typically served after meals around the Bay of Naples in Sorrento, the islands of Capri and Ischia and along the Amalfi Coast. 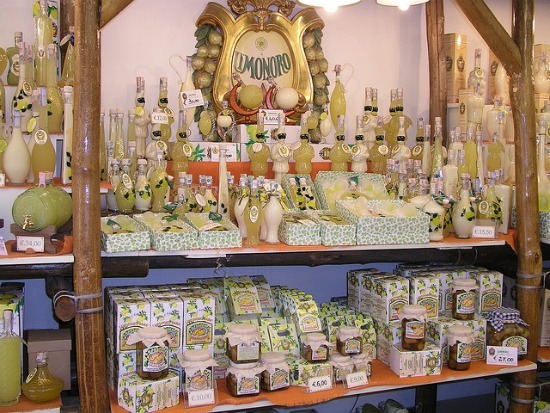 In Sorrento you'll find shops dedicated to limoncello (below) where you can sample different varieties as well as find lemon infused chocolates, candies and gifts. 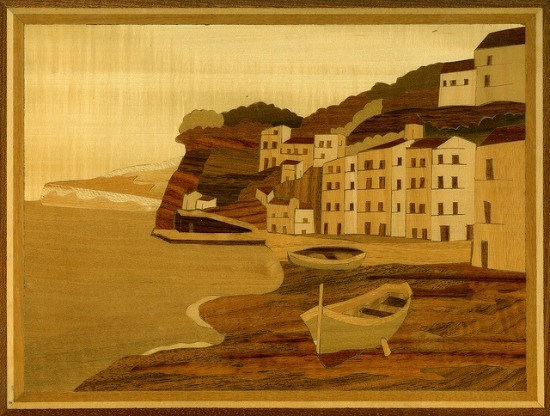 For centuries artisans in Sorrento have perfected the art of intricately detailed wood inlaying, also called intarsia, which you will find on display in shops throughout Sorrento. Some large stores are dedicated entirely to the local craft, and you'll find gorgeous music boxes that play traditional Neapolitan songs, tables covered with incredible inlaid designs and all kinds of objects to display in your home. If you would like to take a break from shopping in Sorrento and learn more about the history of inlaid woodworking in the area and see some of the best examples, stop by the Museo Correale di Terranova not far from the center of town. Whether you're looking for the perfect gifts for family or friends at home or a beautiful keepsake to remember your travels in Italy, Sorrento is a beautiful and lively town for shopping. There's a warmth and southern Italian charm, and perhaps that's what visitors love to bring home and savor the most from Sorrento!